I was lucky enough to receive the Skaven Shadespire warband “Spiteclaws Swarm” for my birthday this year which I planned to use to build the rest of my Skaven players for the Underworld team. I like the Shadespire models as a base for small projects as they’re all in unique poses and the sculpts are really high quality. Though ostensibly monopose, these are pretty straight forward to modify particularly if you have a lot of ghoul arms on hand as I do – the ghoul arms and hands are more or less perfectly sized for scrawny skaven, though I used some putty to bulk out the arms here and there and add some fur texture. For the linerats I swapped at least one arm into a more Blood Bowl appropriate pose (e.g. running, clenched fist, palming off an opponent) and added a Cadian shoulder pad or two which I find perfect for Blood Bowl players due to their vaguely sporty appearance – each player needs a place to locate their team number after all. I don’t anticipate the linerats gaining many mutations but on the off-chance, most had the arm I was replacing magnetised. I liked all of the poses of the base models bar the charging Skaven with a polearm, whose head seemed to be kinked a bit too far off centre, so I cut off that head and took the opportunity to magnetise it too. 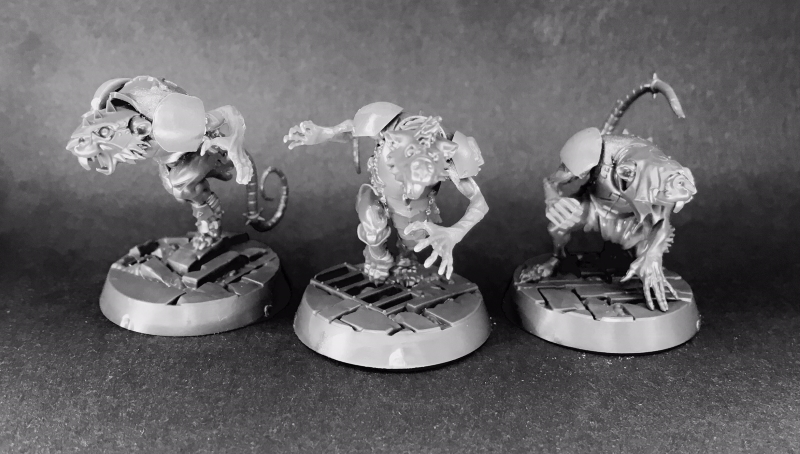 I’m just using the new BB Goblins for my Underworld Goblins (3 of which are above, along with the teams score or turn marker – an old Night Goblin musician that snuck in to the shot). There are four poses and I managed to get 3 of the same one among the six I picked up, so two of those were modified by cutting and repositioning limbs. 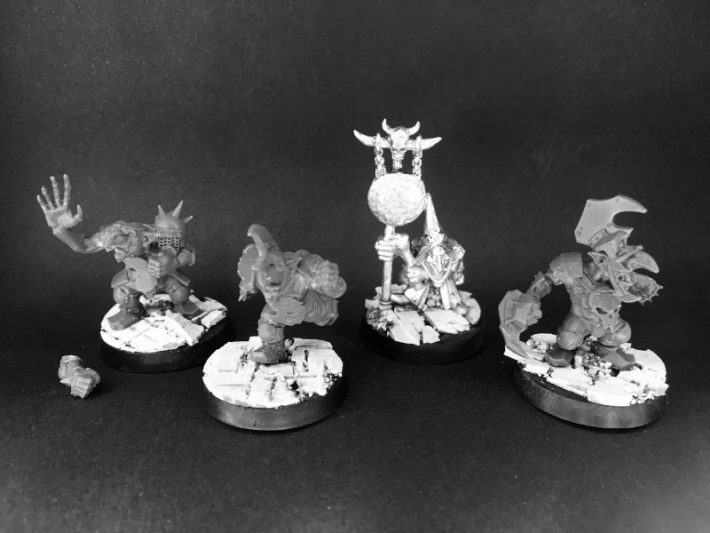 A few goblins have magnetised heads (for two heads/horns mutations) and I used some Beastman horns from the bits box to create a horned Goblin head. 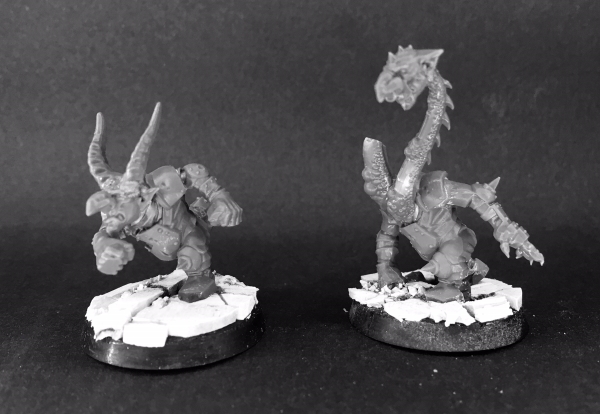 Meanwhile a Nurgle tentacle (cut in two and then spliced at the base) and a couple more heads will make a striking “two heads” mutation option. Most of the time is spent on tiny details that are more or less impossible to show in a photograph, especially concealing the magnet joins. Different joins call for different solutions here – for example, skaven heads have fur or bunched up hoods or robes, goblin arms or hands are cut where t-shirts or gloves begin, which if done precisely suffices with no further gap filling but usually my magnets would be misaligned or slightly proud of the surface so require putty. Shoulder pads are useful for covering a magnet join and generally don’t need any more filling. When sculpted gap filling was needed, I would usually apply superglue to one side of the join (e.g. the head) and stick a bit of putty to it, then coat the other side of the join (the neck) with saliva so the putty won’t stick to it (vaseline or oil will also work, but need cleaning after). Then, mate the two pieces, pushing them together so the magnets meet and the putty adopts the surface shape of the other part. While in this position I would quickly sculpt the necessary detail to conceal the join, then leave it to dry. The saliva should ensure the putty won’t stick thoroughly to the other side, so once cured you can separate the pieces and you’re left with a perfect matching part (albeit one that generally only fits a particular model in the team, which I was fine with – I don’t mind making and painting a few extra heads and arms if it means the final models all look as good as possible).